Prince William finally applied for her lover Kate Middleton. He pinned the deceased's fiance's mother's ring, Princess Diana, in Middleton's fingers. The 18 carat ring made of oval sapphire surrounded by diamonds was given by Prince Charles to Diana for their engagement at that time. This cinnam of course gives a sentimental impression to the heir of the two thrones of the British Empire. William admitted at a press conference about the reason. "(Ring) is very valuable to me as well as Kate is very meaningful to me and this is the right time to unite the two hearts," he said. According to the royal writer, Mark Saunders, the engagement ring is a sapphire ring surrounded by diamonds. Lady Diana's ring was last seen in public when Charles and Diana divorced in 1996. Now on Kate's finger, the ring was pinned. Prince William of England admitted he was truly afraid of losing his mother's engagement ring, so he kept it in his backpack for three weeks, before applying for his girlfriend, Kate Middleton. "I carry the ring everywhere and continue to be in my backpack, for about three weeks," said Prince William regarding the sapphire gem ring, the legacy of his late mother, Princess Diana. "I was really scared. Don't let the ring disappear. Therefore, I carry the ring wherever I go. I do not dare to save it, because if the object is lost, I will definitely face a big problem, "he said. "This is the way I make sure, my mother participated in all the excitement during my marriage," Prince Williams said when asked about the use of a ring belonging to his late mother when he leaved Kate as quoted by The Sun. 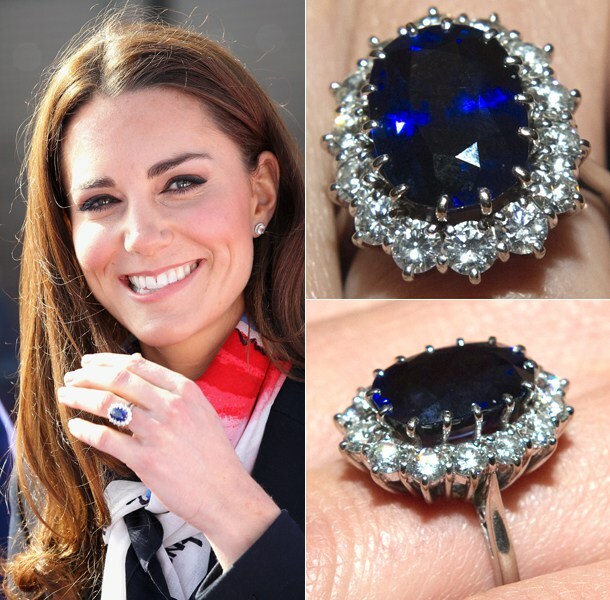 The blue sapphire ring with 18 carat diamond was pinned by Williams to Kate's finger when applying for her lover while on vacation in Kenya last October. Williams claimed the ring was his only personal reminiscence of his mother who died at an accident in Paris in 1997. "That was my only personal reminder after my mother's departure," Williams said. "The ring also reflects the period in my parents' lives when they were truly happy," he said. Kate herself admitted to being shocked when given Purti Diana's precious ring when she applied. "Very, very special. This ring is very beautiful," said Kate, who claimed to have talked about wearing the ring at the time of the application, with Williams palace St. James. Prince William and Kate Middleton have been in a relationship for eight years since they both studied at St Andrews. Marriage is likely to be held in St Paul Cathedral or Westminster Abbey. And if Williams officially ascends the British throne, Queen Elizabeth will give Kate the name to Catherine Elizabeth. I hope the marriage will last forever. Kate herself was surprised when William proposed to her. "We are with friends, so I did not expect to be offered," Kate said. "For sure, I am very happy." Kate is said to have an elegant dress style. His elegant style may be due to the role of a Brazilian-born designer named Daniella Issa Helayel. In the hands of designers who have dressed in world celebrities, such as Madonna, Scarlett Johansson, Princess Eugenia and Princess Beatrice, Kelly Osbourne, Lizzie Jagger, Naomi Campbell, and Peaches and Pixie Geldof, Kate's style of going to the palace deserves a thumbs up. For years, Kate has had good relations with the owner of the Issa London label. At least this is a good capital for Kate in terms of dress as a prospective occupant of Buckingham Palace, England. "I like his character. He is very elegant and chic. You could say, he became an unofficial ambassador for my label," Issa said, as quoted by the London Fashion Week 2010 site, some time ago.